Everyone's favorite toy veterinarian is in for your child's birthday party. 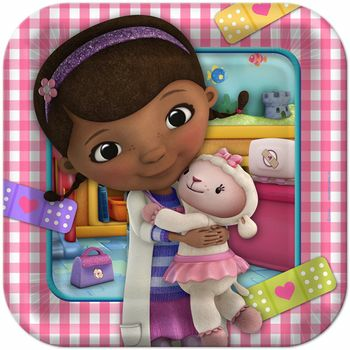 Doc McStuffins saves the day with the help of her toys Stuffy the Dragon and Lambie the Lamb. When a toy needs medical advice, they come to Doc McStuffins. Now you're children can have a Doc McStuffins themed party with out wide selection of party favors and party supplies. Your child's favorite characters will come to life on their paper plates and cups. Familiar characters grace the party favors and supplies in one of Disney's newest masterpieces. Take a prescription for fun! Our Doc McStuffins Party Supplies feature themed tableware such as Doc McStuffins plates, napkins and cups. Add Doc McStuffins accessories, party favors, decorations, invitations and other Doc McStuffins Party Supplies for an adorable Doc McStuffins birthday! Mix and match Doc McStuffins Party Supplies with our solid color tableware for a custom birthday theme. Doc McStuffins Birthday 9" Square Dinner Plates, 8ct. Doc McStuffins Birthday 7" Square Dessert Plates, 8ct. Doc McStuffins Birthday 9oz. Paper Cups, 8ct. Doc McStuffins Birthday Lunch Napkins, 16ct. Doc McStuffins Birthday Beverage Napkins, 16ct. Doc McStuffins Birthday Plastic Table Cover, 1ct. Etched Lillian Clear Plastic Forks 48ct. Etched Lillian Clear Plastic Teaspoons 48ct. Etched Liilian Clear Plastic Knives 48ct. Doc McStuffins Birthday Hair Bands, 4ct. Doc McStuffins Birthday Sticker Activity , 4ct. Doc Mcstuffins Happy Birthday Banner, 1ct. Disney Doc McStuffins Birthday Party Postcard Invitations, 8ct.